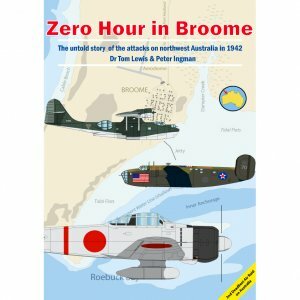 Zero Hour in Broome includes much original research of academic standard, while at the same time it will appeal to a wide audience and contains many colour illustrations. The lead author, Dr Tom Lewis, OAM, has first class credentials. He is a serving naval officer in Darwin and a nationally recognised expert on the war in northern Australia. For the first time, Zero Hour in Broome examines the actions of senior officials in connection to the second most deadly air attack on Australian soil. This occurred when Zero fighters destroyed 15 flying boats at Broome, some of them packed full of women and children evacuees from Java. Sadly, they made up most of the casualties. At the same time as this horror was unfolding, other flying boats were landing safely in Exmouth Gulf, many miles to the south. So why were all of the flying boats not diverted there? This is just one of the many fascinating questions raised by this publication. The book also profiles the many different aircraft types used during the Broome operations. Other unique reference material includes a list of all of the Broome pearling luggers and their fates as a result of the “scorched earth” policy imposed by the Japanese threat.